What kids are learning: This collection of historical games uses quirky humor to teach a notable amount of late-nineteenth and early-twentieth century cultural and technological history in a few relatively short games. 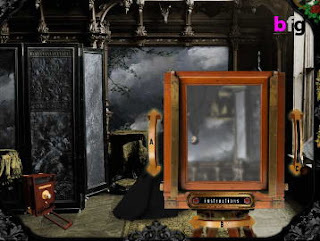 Players are sure to learn a surprising fact or two, although despite the occasional inclusion of historical artifacts from the McCord Museum, these particular games do little to incentivize players to explore history on their own or to probe more deeply into the scenarios presented. In a slight deviation from previous reviews, this week I am not reviewing a single game, but rather I'm taking a closer look at part of the collection of historical games available online at the McCord Museum website. The McCord Museum is "a public research and teaching museum dedicated to the preservation, study, diffusion and appreciation of Canadian history," with an appreciable collection of material artifacts from Canada's, and particularly Montreal's, past. 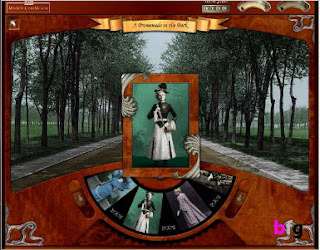 As part of this effort to further the diffusion and appreciation of Canadian history, the McCord site has a fairly expansive collection of online Flash games with historical themes, including the three role-playing games reviewed below. Historical simulations are at once a popular gaming sub-genre, and at the same time, a category of games in which there is a seeming dearth of truly rich educational experiences. 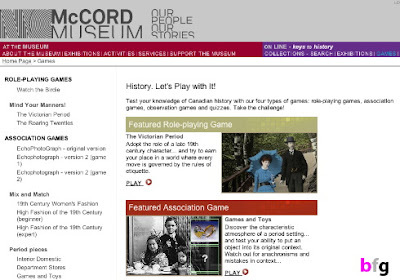 The games on the McCord site are certainly not meant to compete with high-budget, large-developer gaming titles with historical elements like the complex nation-level simulations of Civilization or Europa Universalis, or the visually immersive historical fiction found in the Assassin's Creed series or Red Dead Redemption, but they surpass much of what exists today in the realm of many educational historical simulations on the web. Maybe it's mere nostalgia that colors my perception, but once upon a time, historical games had all the appearances of being a breakthrough success in the age when personal computers were just taking off. Gamers my generation and younger almost all have fond memories of playing games like Oregon Trail or Where in Time is Carmen San Diego? at home or in school. While both were somewhat shallow as educational programs, they made places like Fort Kearny and Hadrian's wall, diseases like dysentery, and authors and artists like Katherine Anne Porter and José Orozco known to kids who otherwise would never have given a second thought to either the travails of nineteenth-century homesteaders or though about history and culture much beyond the borders of their own country. But while Oregon Trail and the Carmen San Diego games became long-enduring franchises in the world of educational gaming, few historical simulations ever achieved that same level of success. Once popular titles like Sid Meiers' Pirates! developed a cult-like following, but never met with much long-term success. Despite the richness of history and its ability to tell us stories meaningful to our modern lives, it is arguably a difficult subject for a game. At its heart, most gaming is about empowering players; it's about giving them choices and the freedom to succeed or to fail. I suspect one of the difficulties of making compelling historical narratives into games is similar to the difficulties that have traditionally plagued games made based on popular films: when the script has already been written, and the outcome known, it's hard to give players the sense of freedom that they need to make the gameplay meaningful. Moreover, history is complicated. Countless variables and contingencies shape the course of human events. How can you pack the whole of a historical time, place, or even into a neatly scripted game that can have only a few very limited outcomes? And what is the point even of playing games of historical "what-if?" when the possible different outcomes for any one historical event are both unknowable and near limitless? Because these problems seem inherent to historical gaming, the most popular and effective historical simulations today tend to be war and battle simulators (Company of Heroes, Total War series, Insurgency), some of which are spiced up a bit by having a fair amount of simple economic simulation thrown in. The primary unit of importance in this games is not usually the solitary everyman historical actor, but the solider, general, or nation-state. While such games are undoubtedly often fun, for the most part, they lack in helping players understand with any depth the culture, politics, or technologies a bygone world. Mixing satisfying play with historical depth is a considerable challenge, and if today's blockbuster games often fail on this front, it should not be all that surprising that the world of free gaming on the web also offers fairly limited choices in the world of historical gaming. What drew me to the historical role-playing games on the McCord Museum site was the blend of humorous historical art style and writing, combined with smartly written dilemmas for players to solve involving somewhat unlikely topics for historical simulation. The games are short and only scratch the surface of what might be possible with historical gaming, but I think they suggest interesting and unconventional twists on the conventional, creating new possibilities for how to make more enriching historical gaming. All three games follow an almost identical gameplay style, not surprising given that they were all designed and programmed by the same developer, Pakobrats. In all three games, players select a male or female character to begin with (although they must play both roles to complete the game) and then answer several multiple choice questions about how that character should act in variety of different social and professional situations. Making players must go through both male and female roles for each setting was a particularly instructive addition, and being able to play through similar scenarios but with questions geared toward highlighting the differing expectations for each of the sexes nicely brought home just how different gender roles were for all of the time periods covered in these games. WWAVD - What would a Victorian do? Players who answer questions correctly on the first try receive the highest score, but all players must eventually choose the correct answer in order to advance. Such quiz-style game play is not particularly innovative nor is it inherently immersive, but it is a mechanic not wholly mismatched to the games' main premise of role-playing a historical character. 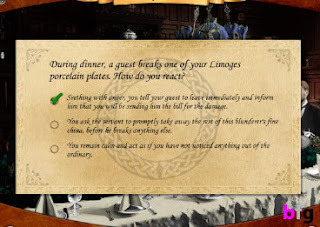 In each situation, players are presented choices as though they were in fact living that particular social scenario and trying to decide on a proper course of action. Reinforcing this are relatively detailed environments built from historic images and occasionally artifacts from the McCord Museum's own collections, which really help to capture the feel of the period being explored. Explanations for both correct and incorrect answers break immersion in some way insofar as they are written explicitly for the edification of a modern player, not to mention the fact that the accompanying animations are often quite zany. But the humor and aesthetic design employed is actually critical to making the simple question-and-answer style core mechanic feel considerably more engaging than your average history exam. The games have an undeniably cheeky style of humor, at once anachronistic and yet appropriately vaudeville-esque. Both the humorous animations and the detailed visual environments lend a certain amount of replay value to what might otherwise be a rather trite exercise in simply guessing the right answers. Unfortunately, the mechanics of the games themselves give little incentive to play the games more than once. Each game has roughly four stages per character, and roughly four questions per stage. Getting an answer correct on the first try results in a higher score than making several wrong guesses, although all players must eventually select the correct answer in order to advance. But "advancement" may be the wrong term: there is no real progression in the sense of stages having increased difficulty or players getting to apply knowledge gained from previous scenarios. The only progression involved is progress toward completion, and completion itself is a bit of a letdown. None of the games have much to offer in terms of an ending. In fact, both games in the Mind Your Manners! series actually leave players trapped on game's main screen after they have successfully completed all scenarios. There is no option to reset the game from within the game--players must reload the page to play again. This comes off as a missed opportunity to entice players who enjoyed the games to research the periods further without outside reading, or to explore the McCord website for artifacts related to the games just played. Regrettably, a final technical downside of all of these games are the occasional game-breaking bugs that I encountered multiple times. Using both a variety of platforms and browsers, I repeatedly encountered flash/shockwave errors that brought the game to a grinding halt. Eventually, I was able to play all games to completion, but more QA testing, or, at the very least, listing browser and system requirements would have been recommended before releasing these. Also, even though the games are fairly polished, I did find occasional typographical error or strange character renderings like "YYou"and "oneâ€™s." Although such mistakes are understandable, they mar what are otherwise very highly polished games. In this rare example of a game centered on this history of a technology, photography, Watch the Birdie puts players in the shoes of both an early studio photographer and an affluent female customer. Players are faced with a number of choices on everything from more technical aspects like what camera to use and how to frame and properly expose the photographic subject, to more social aspects of sitting for a photograph, like how to make appointment for a photographic sitting and what format of photograph will best impress your friends and family in the 1870s. In some ways this game, more so than the others reviewed here, pushes players to think carefully about the rapidly changing landscape of the time. If you are not well versed in the history of photography, guessing in Watch the Birdie is apt to produce many wrong answers, particularly when playing as the photographer. You need only be off by about 5-10 years in your estimate of the technology appropriate to the time period to make erroneous choices. At first blush, this is a little frustrating, especially as some of the "wrong" choices are only wrong in terms of not being the "best" choice, but not because they are strictly incorrect. Yet, while the perfectionist in me was irked at making close-but-ultimately-incorrect guesses, it nonetheless proved a more educational experience than if the game were either overly forgiving, or prone to make the "correct" choices exceedingly obvious. Still, there aren't ways to really intuit the right answers from the game on the first play through, and clueless players are not likely to improve as they go along. It seems to me that there is a missed opportunity here to encourage players to try and research the answers first before simply guessing at them. In this game, we move away from the history of a technology and take on the tricky problem of understanding etiquette and manners in the Victorian era. 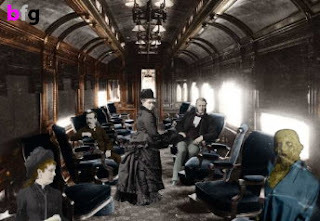 Players are confronted with four different social settings (a dinner party, a fancy ball, at the rail station, and in a leisure setting) for which they must dress and act appropriately and according to the latest fashions of the time. The gameplay is structure almost identical to Watch the Birdie, and while once again the humor and art style make for entertaining play, it also suffers from some of the same weaknesses. Although the game has no explicit hierarchy among the settings (as in, one area is supposed to be easier to complete than others), I nevertheless found some social settings to be trickier than others to successfully navigate. In my experience, being well-mannered in the ballroom and dinner party areas was relatively easy to achieve. Whether this is part of the designers' intent, or rather more reflective of my own personal knowledge of Victorian culture is hard to say. My exposure to Victorian culture through the literature of the period tends to involve more ballroom/dinner scenes than train rides, so it is entirely possible that players' experience of difficulty here will be based on exposure more than anything else. Yet, as with the Watch the Birdie game, there is occasionally a sense of artificiality to the choices which may make some areas more difficult for the wrong reasons: choices don't always feel like they're in opposition to one another, making it a bit difficult to understand why one choice has to be selected to the exclusion of another. For example, in the train scenario, you are asked what it is that a lady should keep in mind as she heads off to the train's dressing room. Should she be worried about maintaining her appearance ("Ensure that your clothes are properly adjusted before leaving the dressing room")? Or should she make sure not to take too long in the dressing room (" It is very impolite to monopolize the conveniences by spending too much time there,")? Of course, both are true. The answer that the game expects in this particular scenarios is to mindful of monopolizing the dressing room, but players who initially guessed that appearances still matter for a Victorian lady, even on a train, don't get any explanation for why that instinct is incorrect here. "Attempt to keep your dress neat at all times," is the rather engimatic reproof given for this wrong answer. considered very rude in the Victorian era. Of course, some ambiguity is to be expected from any kind of multiple choice scenario, but in the context of an educational game, having such overly subtle differences between choices is frustrating. Players' only incentivization to continue progressing through this kind of game is to get the answers "right" and to "win" with a high score. When the questions are frustrating due to careless design, it discourages players from putting as much effort into puzzling out the next answer. And if the mechanism of feedback is inadequate, or worse, misleading, it undermines the educational value of the game. Another example of confusing feedback appears in the scenario in which the female character takes a recreational stroll through the park. Players are told in one situation that "The kiss is the most affectionate form of salutation, and it is only proper among near relations and dear friends," but in the very next question, choosing to greet friends with a kiss is considered a "prevalent," but "vulgar" custom. Both seemingly contradictory statements may very well be true and indicative of the elaborate social codes that regulated interactions in the Victorian period, but closer attention to the flow of questions and the information presented in each scenario might have given players a better chance of figuring these elaborate codes out well enough to succeed in the game. Identical in play to The Victorian Period, The Roaring Twenties also borrows visual assets (like outfit choices) from it's Victorian counterpart. This is a bit of a disappointment--the games already share so much in terms of structure and design that they could benefit from at least having totally distinct content. However much The Roaring Twenties is somewhat slavish copy of The Victorian Period in play and structure, in terms of content, this game seemed to have more akin with Watch the Birdie. The 1920's were a period of rapid social and technological change, and the questions in this game revealed some surprising answers. So surprising, in fact, that the historian in me would have loved to see links to sources somewhere in the game. There are specific references mentioned in the answers to some questions, and I don't mean to impugn the accuracy of any of the material presented in the game. Rather, this is general difficulty with any presentation of history trivia; it's always nice to be able to further investigate a surprising answer, and a game like this should ideally make every effort to capitalize on and foster players' curiosity. The Roaring Twenties is also a bit more notable than its companion games for incorporating some Canada-specific history. I found myself pleasantly startled out of my unconscious American history-biases more than once while playing this game, particularly with respect to Prohibition. One of the defining features of the 1920's in the United States, and I had no appreciation before playing this game for the differences between the U.S. and Canada in that respect. Perhaps its a bit selfish to say that I would have liked to see these differences possibly pushed a little bit farther. This brevity, combined with the slight incoherence of the role-playing element in each of the games on the McCord site, is probably one of the greatest shortcomings of these games. No matter how drawn in players may be initially by the fantastic art deco styling of the The Roaring Twenties interface or how much they may enjoy the playful portrayals of a stuffy Victorian dinner party, in the end, there isn't much to keep players immersed, nor is there any opportunity for further exploration. The arbitrary power to switch back and forth between male and female characters lends valuable perspective, but at the cost of feeling in any way attached to a character or role. More story, context, and content in each of these games would have given some much needed depth to the games' advertised "role-playing" element. The inclusion of a scoreboard in the Mind Your Manners! series was also fairly arbitrary and immersion-breaking. Making wrong choices means players have to keep guessing answers until they pick the "correct" one, even though some of the "wrong" choices are not wrong so much as they are simply not the best answer for a particular question. Although it is understandable that, in an educational game, there is a desire to make sure players make the optimal choice before they are allowed to move on, there are times when being allowed to move on after a less-than-optimal choice would seem more appropriate. Players would feel more like they were actually inhabiting the role of a particular character, and making real social blunders with consequences. The relative quality of the choice could be easily conveyed by a clear, consistent, and meaningful scoring system. Currently, the games are all very much on-rails: players must always select the "correct" answer to advance, making the final score a relatively inconsequential measure of success and eliminating much incentive to play through a second time. In essence, the play ends up being more akin to clicking through an animated storybook rather than playing a "game" with measurable and meaningful consequences for player decisions. 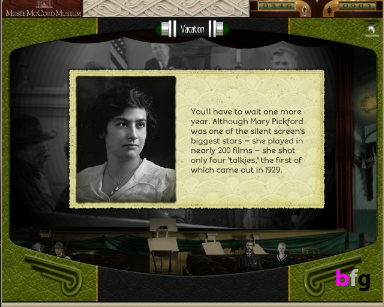 The historical role-playing games on the McCord Museum website aren't going to break any ground in terms of gameplay, but by invoking a little bit of humor and using a quirky, but historically appropriate art style, the games stay relatively engaging. The subject matter is predominately culturally-themed, which makes these relatively unique among other historical simulations. For free, casual historical games, these certainly seem to be among the best. That being said, they are generally limited in replay value and the humorous animations are a little over the top at times. The role-playing elements are entertaining, but also largely superficial, making those players who are enchanted with the historical period left wanting more. Not that this is necessarily a bad thing, but the games' lack of secondary references or integration into the McCord Museum's own website means that any impulse to further exploration will have to be guided by the player's own instincts. Nevertheless, these games are proof of the existence of fun, casual history webgames.